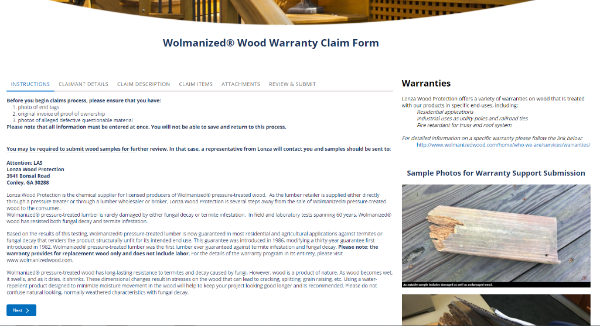 We are pleased to launch Lonza’s Wolmanized® Wood Warranty claims website. This automated system is designed to streamline the claims management process. In this system, a claimant can upload photos of questionable wood as well as end tags and invoices, and will receive notifications as the claim goes through each step of the process. In addition, claimants will have quick links to the Wolmanized® Wood Warranty as well as access to educational resources about selection and use of pressure treated wood, building tips and other general information. As long as additional samples and/or a site visit are not required, it is our goal to have each claim closed within 10-15 business days. While we will still accept claims presented through the mail, claimants will receive quicker review and status updates if their claim is driven through this new system. The new claims system can be found at www.WolmanizedWood.com. Click on the Process a Claim button.